Welcome to Hester Roofing & Gutters, Inc.
Thank-you for considering Hester Roofing & Gutters, Inc. for all your roofing needs. We specialize in all phases of the roofing process, from roof repair to re-roofing, from maintenance programs to complete roof overhauls. Our roofing family at Hester Roofing & Gutters, Inc. is dedicated to serving your needs in a timely manner with an emphasis on quality craftsmanship as well as a commitment to customer service excellence. 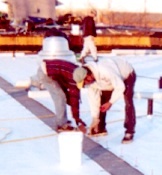 We pride ourselves on being a "one-stop contractor" in the roofing industry. Copyright © 2012. Hester Roofing & Gutters, Inc. All Rights Reserved. Hester Roofing & Gutters, Inc. is a top quality roof repair and roof replacement company serving the DFW Metroplex - Dallas, Fort Worth, Arlington, Plano, Mansfield, Garland, Denton and surrounding areas. Hester Roofing & Gutters, Inc. is dedicated to Roofing in Dallas and Fort Worth Roofing. Our goal is to be known as the top Roof Repair Company in the Dallas / Fort Worth Metroplex. So if you need a Dallas Roofing Contractor or Fort Worth Roofing Company to repair your roof damage, then contact Hester Roofing & Gutters, Inc. for Roofing Fort Worth or Roofing in Dallas TX. While there are many Dallas Roofing Companies to choose from, Hester Roofing & Gutters, Inc. has a reputation for being one of the best Dallas Roofing Contractors when it comes to Dallas Roofing Repair. Contact this Dallas / Fort Worth Texas Roofing company today for a free inspection and discover why we are second to none among Roofing Companies in the Dallas and Fort Worth metroplex. Commercial Roofing in Dallas and Commercial Roofing in Fort Worth - Hester Roofing & Gutters, Inc. specializes in residential roofing and commercial roofing. Contact us for help with your roof replacement and leaking roof repair. We are a dedicated roof contractor, roofing installers, Roof Company and roofing consultants waiting to take care of your roofing concerns. Residential Roofing in Dallas and Residential Roofing in Fort Worth - Hester Roofing & Gutters, Inc. knows your home is one of your most valuable assets and we take the opportunity to be your Residential Roofing Company very serious. Contact us today for a free estimate and rest assured you are in good hands with Hester Roofing & Gutters, Inc.